A movement for Black women to tend to our mind care, heart care and soul care. Sisters Mentally Mobilized (SMM), a project of the California Black Women’s Health Project, is a statewide movement that trains Black women to become mental health community advocates and launch mental health-focused Sister Circles in the communities where Black women live, work, play, and pray. Too many of our sisters are suffering in silence. Sisters Mentally Mobilized aims to reduce mental health stigma, anxiety, and isolation among Black women and create space for us to tend to our minds, hearts, and souls. ​Sisters Mentally Mobilized is funded by a grant from the California Department of Public Health, Office of Health Equity, and is part of the California Reducing Disparities Project. Calling all Sacramento sisters, we are coming to your area and we can't wait to connect with you! 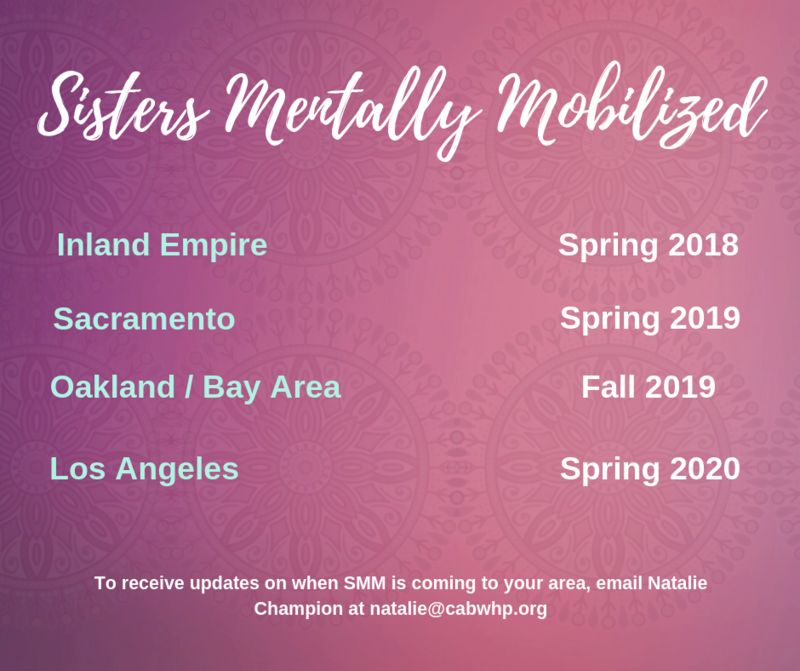 The Sacramento Sisters Mentally Mobilized cohort is launching in Spring 2019! Click the link for more information, and to apply! ​Listen to our interview on 97.5 KDEE Full Circle with host Ms. Wanda on her Saturday Show "Empowerment Through Conversation" to learn more about Sisters Mentally Mobilized Sacramento! Between our roles as mothers, wives, partners, sisters, students, entrepreneurs, caregivers, and employees, along with pervasive racism and sexism, most of us are working twice or three times as hard to hold it together. While the outside world marvels at our ability to seemingly make it all work, inwardly we feel the price we are paying--and sometimes the cost is our mental or physical health. ​​​Sometimes we need space away from a world that too often tries to convince us that it is a problem to be a Black woman in America – we need a space to set it all down, talk it out, breathe, get support from our sisters, and love on ourselves. Sisters Mentally Mobilized is that space, a movement for Black women to tend to our mind care, heart care and soul care. ​Who is Sisters Mentally Mobilized for? ​SMM is for any Black woman 18 or older who has stories to tell and experiences to share. At the California Black Women’s Health Project, we know that there is wisdom and beauty in every Black woman’s life journey. ​We are reaching out to our sisters in Los Angeles County, Oakland/Bay Area, Sacramento, and the Inland Empire (Riverside & San Bernardino) to join the Sisters Mentally Mobilized movement for personal and community healing. The Advocate Training Program is the introductory experience of Sisters Mentally Mobilized. Over the course of several weeks, participating sisters gain a deeper understanding of the forces that contribute to mental health stigma, anxiety and isolation in Black women; share and learn coping and support strategies; identify community priorities for mental health advocacy and organizing; and craft solutions for promoting individual and community well-being. The SMM-ATP prepares Black women to establish and lead mental-health focused sister circles in their communities. Sister Circles have been part of the Black female experience for over 150 years. From living rooms, community halls, college campuses, church basements and beyond, sister circles continue to be safe spaces for Black women to ‘talk, deal, and heal’. Following in that tradition, Sisters Mentally Mobilized- Sister Circles are support groups for mental health empowerment, healing and activism. SMM-Sister circles serve as a platform for members to take action in response to issues affecting mental health and wellness in their lives and communities. ​With ongoing support and training from CABWHP, SMM-Sister Circles are developed and facilitated by women who have completed the SMM-Advocate Training Program. Want to be the first to know when Sisters Mentally Mobilized is coming to your area, or have a question? Send us a note and we'll be in touch!
" My sisters, in the face of so much, you rise, and I see you. Rest your hearts and minds for a while."